This basic diagram is quite meaningful for me and I’ve written about it on my website. A good symbol is evocative—it evokes new associations, creative meditations. For me, my mandalas are two-dimensional visual expressions of the creative process. This variation of the shree yantra partakes of both the aesthetics of geometry and the spontaneity-elaborative process of musical composition. 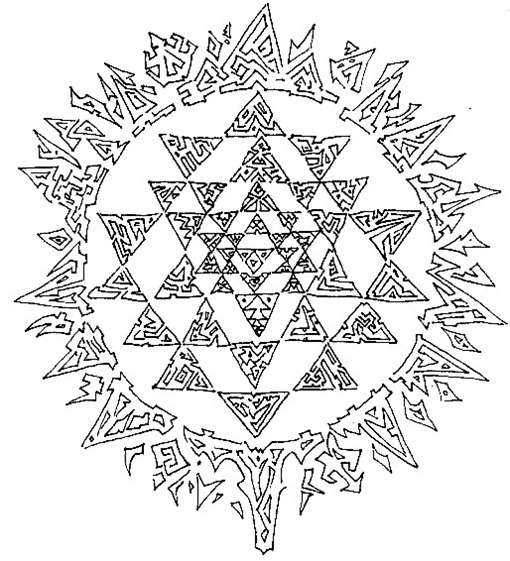 Using the geometric resonances of the sacred Hindu form that combines multiple interpenetrating upward and downward triangles, the primal design shown here (the small designs in the major triangles are my own improvisation, as are the figures around the circle) begins within the three triangles that form the central triangle. This base “melodic theme” then gets “musically” varied. Converting artistic forms to musical melodic elaborations is a bit of a synesthetic trick, but use your imagination. The whole of the mandala is an amplification of the Chinese saying that Yan and Yin can combine to make the “ten-thousand things”—a figure of speech to suggest unending permutations of form as expressed in the relatively shallow frame of two-dimensional art. The point here is that line, figure, space, can suggest a profound potential for proliferation in the realms of space-time. What cannot begin to be represented because it would be far too complex is the way each element is both composed of profoundly complex components and in turn contributes to a larger pattern of integrated components. Add, too, that this whole “organism” undergoes many transformations over time—including birth and death—and operates yet as an integral but humble part of a yet-greater super-organism that includes many dimensions of being. This holistic pattern also suggests that the organization of the cosmos is not at all linear—a ladder-like hierarchy of one god, one king, one duke, one peasant. Such a model was convenient both for the human power structure of the middle ages, and for simple-minded humans demanding loyalty and pledging fealty. But few were able to conceive of anything beyond this medieval political organization. In reality, government—even the “rule” of an old duke’s castle and lands, involved scores of other involvements ranging from the variably independent operation of the church or abbey, to the many-leveled organization of, say, the kitchen, its links with food supplies, and so forth. There were many concerns for governing, so that there could be little room for thinking deeply about he significance of all those roles. The point here is that a simple ladder of loyalties was an artificially simplistic model and that mere rank did not sufficiently account for the complexity of the actual system. How much more so that is in the real nature of complex, highly complex, and inconceivably complex organizational “structures.” Part of the complexity is due to the way any given element may participate in many different systems and involvements. All of this, then, is a kind of visual hymn to the spirit of Everything Becoming, which is one of my names for the Encompassing Ultimate “Reality” that tends to be personified as a deity. I comment more on my neo-Spinozan, somewhat Whiteheadian philosophy (and “theology”)—mixed with other philosophies and psychologies, that works for me to bring me solace, hope and direction.